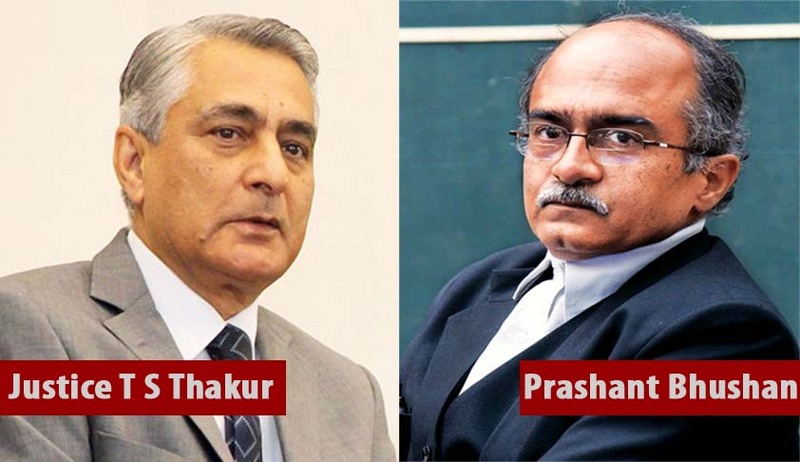 In a letter to Chief Justice of India, Campaign for Judicial Accountability & Reforms (CJAR) Convenor Prashant Bhushan has applauding the judiciary's move rejecting some of the clauses in the government draft of the Memorandum of Procedure for appointment of Supreme Court and High Court judges and sought greater transparency and public consultation in preparing a new MOP for Judicial Appointments. The Campaign for Judicial Accountability & Reforms (CJAR) is a response of people’s movements, campaign organizations and individuals working on public interest issues, to ensure a judicial system that is more accountable, accessible and sensitive to the poor, marginalized and common people of this country. We are writing to you in the context of the news item appearing in the Indian Express on May 6, 2016 titled “SC collegium unhappy with govt’s draft procedure” which states that the collegium of Judges headed by your Lordship has rejected the “national security” clause which the Central Government had inserted into the Memorandum of Procedure to override decisions of the collegium in respect of recommendation of judges for appointment. This is a very positive development for the independence of the judiciary and we applaud the decision of the collegium to stand firm against an attempted encroachment by the Executive of this basic principle of our Constitution. “National security” is a bogey that has been used. and continues to be used, by Governments to trample upon the rights of citizens in India. The same is with respect to the collegium rejecting the clause that requires the Attorney General at the Centre and the Advocate Generals at the States to have a say in recommending candidates for appointments. This too is an attempt by the government to have backdoor control over judicial appointments, a move that was rightly rejected by the collegium. We are heartened to note that the judiciary is willing to contest the Government’s claims in this regard, in the interests of preserving constitutional governance in India. At the same time, we must express our distress at the process which is being followed in drafting the MoP. There is no publicly available draft of the MoP, no public consultation and no public debate on this vital document that guides the appointment of judges. We do not think that this is an internal, administrative document that must be kept out of public view for whatever reason. There should as much transparency in the process of drafting of this document as in the mechanisms for appointment that the MOP deals with. The MOP has an important bearing on the independence of the judiciary, especially with regard to the appointment of judges to the Supreme Court and the High Court. The Campaign for Judicial Accountability and Reforms had written to the Hon’ble Finance Minister, Mr. Arun Jaitley, on the 16th of March 2016, requesting for a public consultation on the MOP and also sending in some of the Campaigns suggestions. We have yet to hear back on this request and in the meanwhile the government draft has reached the collegium for consideration. As your Lordship is no doubt aware, civil society and the Bar played an important role in not only challenging the constitutional validity of the 99th Constitutional Amendment and the National Judicial Appointments Commission Act, 2015, but also participated wholeheartedly in the consequent hearings. Detailed suggestions were given by members of the Bar, different civil society organisations and public spirited citizens, proposing reforms to the appointment process. These suggestions have been taken on board by the Constitution Bench of the Hon’ble Supreme Court as seen in the order dated December 16, 2015 directing the Government to frame the MoP. In the same spirit of openness and transparency that marked the NJAC hearings, we humbly request from Your Lordship that the draft MoP be made public, comments on the proposals be invited, and inputs and suggestions received from civil society and the Bar be incorporated as much as possible into the ultimate draft. We are certain that increased transparency and participation of civil society and the Bar will only improve the quality of the MoP and inspire greater public confidence in the MoP itself as the mechanism to appoint judges to the Supreme Court and the High Court. The appointment process for judges to the Supreme Court and High Courts is vital to defending the independence of the judiciary and civil society entirely shares the concerns of the judiciary in this respect. We look forward to a positive response on this issue.